AUTOMOTIVE CARS - Car Audio Maintenance: Process and Handling - Car audio is a device that is widely used by car users, almost every car must install audio. Audio is one of the entertainment and fatigue friends when the streets are jammed especially if we are traveling without friends, how saturating our journey is. With this audio, the driver becomes entertained because they can listen to music or the radio in the car. But there are many who underestimate this device, most of us do not pay attention to the maintenance just want to use it, even though car audio treatment is not difficult. Well for those of you car lovers, to find out how to care for car audio easily, let's look at the article below. 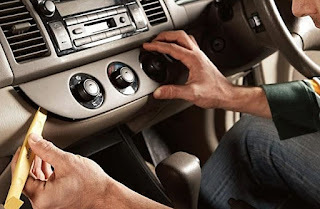 The first step is to care for car audio, which is to turn off the audio first before turning off the car engine, turning off the car engine without turning off the car audio, it can shorten the audio life, when the car audio system stays on when we turn off the car, the audio will automatically turn on when the car back in the starter. If it happens like that, the audio system will get a voltage from a battery that is less stable so that it can damage the components inside. Then if you want to modify the car audio, do it right, buddy, don't carelessly. If the process is carried out in origin, the car audio will be damaged. It is undeniable, CDs with original quality also affect the condition of your audio player, this is because the original CD has an effect on optical performance on your audio player. Poor audio quality was apparently caused by the use of pirated CDs. Pirated CDs do not have audio quality as good as the original CD. In addition, pirated CDs make the device work even harder so that the audio becomes damaged quickly. Well, this will be our reason to always buy an original CD. To maximize car audio care, it's natural that you do other car interior maintenance, friend. The third step is not to be lazy to clean the dust that sticks to the head unit, this is our duty as a car owner if we love the car. Also pay attention to the gaps that are not visible, be diligent in cleaning the sticking dust. If the head unit is off, first check whether the size of the din is appropriate or not, especially if you have replaced the standard head unit using after market products. If before the live head unit is installed but when it is installed dead, the problem is not in the installation but in the weakening of the components in the head unit or in the less normal regulator IC. Before we install or replace the head unit, first make sure that all components of the head unit are functioning properly. Then one more thing you need to pay attention to is the fast heat car audio power can also be caused by dust that has accumulated. Adjusting the equalizer in an audio player is one of the interesting things. Equalizer is made to adjust the sound to suit your ears. Combine between the bass, medle and middle in a balanced manner to provide the best quality sound, in addition to sounding pleasant to hear, this can also extend the life of the car audio everything must be balanced. In addition to disturbing hearing, too loud a sound also makes the audio quickly damaged. In this case using audio with a volume that does not exceed the maximum limit, usually if we use a volume that is too hard, audio players often experience damage due to the impact of sound that is too loud to make the audio become unable to make the best sound. This has also become one of the causes of car speaker damage. if the speaker turns off and to find out the damage, you must first see whether the audio system is using ampliffier or not, otherwise damage usually occurs in the cable section. Like a cable that is stuck in a door or cable attached to the body. The solution is to open the door trim door and check the speaker cable and reconnect the disconnected cable or trim the cable. However, when using an amplifier, it is usually caused by overheating or overheating. The solution is that you don't close the circulation holes on your car amplifier. The final step in maintaining your car's audio, try every single or two months to clean the optics, it is quite easy to clean the audio player optics because there are many optical cleaners sold in car accessories stores. Usually an optical cleaner in the form of a liquid that can be sprayed, clean the optics by spraying using a CD cleaner, then clean it. This can help maintain optics in your car. Now that's the 6 steps of car audio player maintenance easily, so your car's audio will be well maintained. Although often these devices are not considered important, audio is very helpful to avoid fatigue when you are faced with traffic jams. Besides you have to do cleaning regularly, from the beginning you have to know which audio is good by paying attention to tips on choosing car audio to fit the car components that are related. 0 Response to "Car Audio Maintenance: Process and Handling"